El Niño: Is 2014 the new 1997? 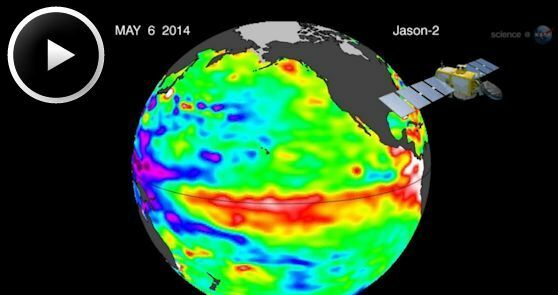 May 19, 2014: Every ten days, the NASA/French Space Agency Jason-2 satellite maps all the world's oceans, monitoring changes in sea surface height, a measure of heat in the upper layers of the water. Because our planet is more than 70% ocean, this information is crucial to global forecasts of weather and climate. Lately, Jason-2 has seen something brewing in the Pacific—and it looks a lot like 1997. "A pattern of sea surface heights and temperatures has formed that reminds me of the way the Pacific looked in the spring of 1997," says Bill Patzert, a climatologist at NASA's Jet Propulsion Laboratory. "That turned out to be the precursor of a big El Niño." "We can't yet say for sure that an El Niño will develop in 2014, or how big it might be," cautions Mike McPhaden of NOAA's Pacific Environmental Research Laboratories in Seattle, "but the Jason-2 data support the El Niño Watch issued last month by NOAA." What Jason-2 has been seeing is a series of "Kelvin waves"—massive ripples in sea level that travel across the Pacific from Australia to South America. Forecasters are paying close attention because these waves could be a herald of El Niño. The two phenomena, Kelvin waves and El Niño, are linked by wind. Pacific trade winds blow from east to west, pushing sun-warmed surface waters toward Indonesia. As a result, the sea level near Indonesia is normally 45 cm higher than it is near Ecuador. Researchers call that area the “warm pool”—it is the largest reservoir of warm water on our planet. Sometimes, however, trade winds falter for a few days or weeks, and some of that excess sea level ripples back toward the Americas. "That's a Kelvin wave," says McPhaden. "It's not unusual to see a couple every winter." El Niño happens when trade winds falter not just for days, but for many months. Then Kelvin waves cross the Pacific like a caravan, raising sea level and leaving warmer equatorial waters in their wake. "The El Niño of 1997/98 was a textbook example," recalls Patzert. "At that time we were getting data from TOPEX/Poseidon, a predecessor of Jason-2. Sea surface maps showed a whitish bump, indicating a sea level some 10 centimeters higher than usual, moving along the equator from Australia to South America." "The same pattern is repeating in 2014," says McPhaden. "A series of Kelvin waves generated by localized west wind bursts in the western Pacific that began in mid-January 2014 are headed east. Excitement is building as a third weakening of the Pacific trade winds happened in mid-April." Ocean and atmospheric scientists at NOAA and NASA are carefully monitoring the Pacific trade winds. The tipping point for declaring a significant El Niño will be an even longer lasting, larger collapse in Pacific trade winds, possibly signaling a shift in weather all around our planet. "It will become much clearer over the next two to three months whether these recent developments are the forerunner of a major El Niño—or any El Niño at all," says McPhaden. "Jason-2 is a marvelous Kelvin wave counter," adds Patzert, "and it will tell the tale."